Mix in 2-3TB horseradish to your taste. Serve with crackers or vegetables! We started taking pictures and preparing to make our first website in 2004. Visit our historic website while we work on our new website. Enjoy! Thank you everyone for making our Fishing Report so fun! Copyright 2018 Watta Bite, LLC. 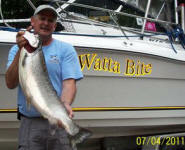 Jim Dexter, Chief of Fisheries for the State of Michigan, ventured out with Captain Bill in April!